Personal papers and photos of Eleanor Wilson McAdoo, Woodrow Wilson’s youngest daughter. Program for the dedication of Wilson's tomb at the National Cathedral on Veterans' Day one hundred years after his birth. 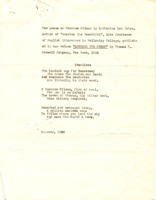 Invitation to Eleanor Randolph Wilson McAdoo from the US Senate for the second inauguration. Program for the events at Wilson's second inauguration. 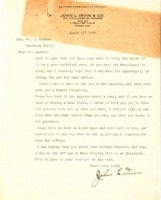 Margaret A. Wilson writes Edith Bolling Wilson to say there is not another bill from Mr. Zuro. Margaret A. Wilson writes Eleanor Wilson McAdoo with news from the Aurobindo ashram in India. 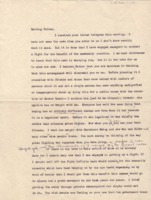 Margaret A. Wilson writes Woodrow Wilson to congratulate him on his Armistice Day speech, and to give him news of her professional life..
Jessie Wilson Sayre writes Margaret A. Wilson regarding a walk. Jessie Wilson Sayre writes her sister with travel plans and family news. 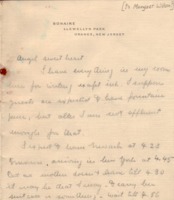 Jessie Wilson Sayre writes Margaret A. Wilson to inform her of her travel plans. 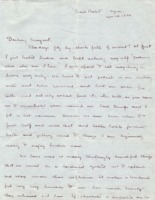 Jessie Wilson Sayre writes Margaret A. Wilson with news from her trip to London. 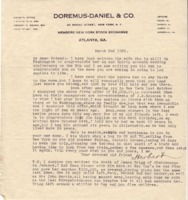 Jessie Wilson Sayre writes Margaret A. Wilson with details of an upcoming visit to New York. 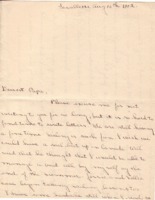 Jessie Wilson Sayre sends Margaret A. Wilson a thank you note. 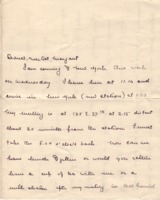 Jessie Wilson Sayre tells her sister, Margaret A. Wilson, of her travel plans. 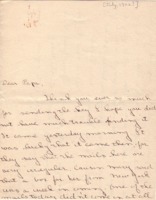 Jessie Wilson Sayre writes Margaret A. Wilson to give family news, and to express sympathy for her sister being robbed. 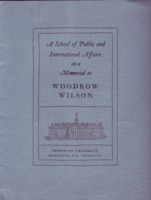 The cover for the prospectus of the Woodrow Wilson School of Public and International Affairs at Princeton University. Eleanor Wilson McAdoo writes Francis B. Sayre about Margaret A. Wilson's death. 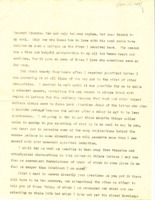 Eleanor Wilson McAdoo writes Margaret A. Wilson with news from the United States. 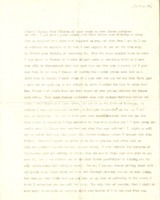 Eleanor Wilson McAdoo writes Margaret A. Wilson, and expresses concern. Margaret A. Wilson writes her sister, Eleanor Wilson McAdoo, with news from the Aurobindo ashram in India. Margaret A. Wilson writes to Eleanor Wilson McAdoo with news from the Aurobindo ashram in India. 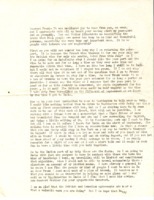 Margaret Woodrow Wilson to Francis B. Sayre Jr.
Margaret A. Wilson replies to a letter from Francis B. Sayre Jr., and explains her practice of Yoga. Margaret A. Wilson writes Sri Aurobindo with spiritual questions. 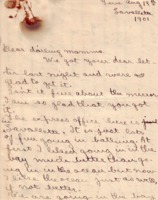 Margaret A. Wilson writes to Eleanor Wilson McAdoo regarding some capsules she sent her. 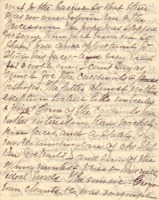 Margaret A. Wilson writes Eleanor Wilson McAdoo with news from a colony of muscians, in Essex County, New York. 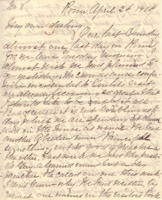 Margaret A. Wilson writes Francis B. Sayre with a request to have her passport extended for her upcoming trip to India. 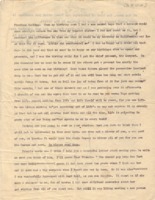 Margaret A. Wilson writes to Sri Aurobindo to ask to become one of his disciples. Margaret A. Wilson writes Eleanor Wilson McAdoo with news from the Aurobindo ashram in India, and tells her that she has changed her name to Nistha. Margaret A. Wilson writes Eleanor Wilson McAdoo with news from the Aurobindo ashram. 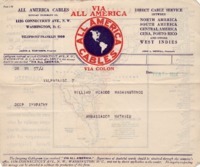 Margaret A. Wilson sends Eleanor Wilson McAdoo a telegram. Margaret A. Wilson writes Eleanor Wilson McAdoo with personal news, and with advice concerning her sister's book. 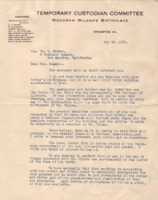 Charles Catlett writes Eleanor Wilson McAdoo a letter to inform her of the establishment of the Wilson birthplace, and to ask for family photographs. Katharine Lee Bates writes two poems of tribute for Woodrow Wilson. 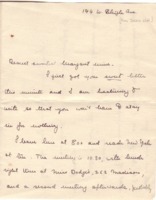 Jessie Wilson Sayre writes Margaret A. Wilson, with news of a trip to India. A sermon by Rabbi Louis I. Newman, in praise of Woodrow Wilson. 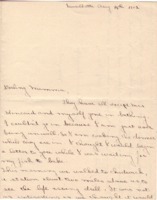 Eleanor Wilson McAdoo writes Margaret A. Wilson, and is quite angry at Edith Bolling Wilson's suggestion that Margaret change her name. 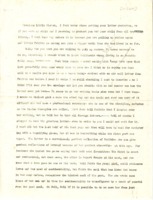 Jessie Wilson Sayre writes Eleanor Wilson McAdoo; they discuss Edith Bolling Wilson's political influence and personality. 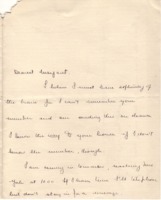 Caruthers Ewing writes Margaret A. Wilson a condolence letter after the death of her father. A memorial address for Woodrow Wilson by David H. Miller, delivered at the Madison Avenue Presbyterian Church, 10 February 1924. J.O. 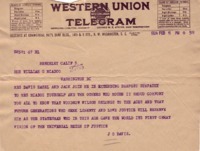 Davis sends a condolence telegram to William G. McAdoo after Woodrow Wilson's death. 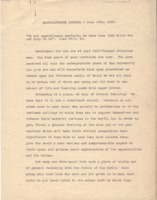 Royal A. Farris send William G. McAdoo a condolence telegram upon learning of Woodrow Wilson's death. 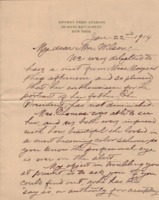 Woodrow Wilson writes Eleanor Wilson McAdoo a thank you note for a box of fruit and nuts. 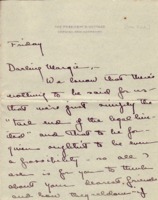 Margaret A. Wilson writes Woodrow Wilson regarding some money she had lent to a friend. Margaret A. Wilson writes Woodrow Wilson to explain her plans to promote a prize fight. 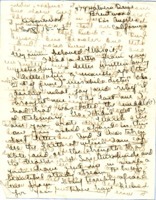 Eleanor Wilson McAdoo writes Woodrow Wilson with news of her family in California. Eleanor Wilson McAdoo writes Woodrow Wilson about her move to California. John L. Irvin writes William G. McAdoo regarding the latter's upcoming moving to Los Angeles, and the housing situtation in the area. 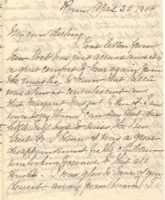 William Wilson writes Margaret Axson Elliot a letter seeking to do business with the McAdoos. 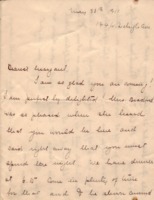 Edward Elliot sends William G. McAdoo a letter from William Wilson. 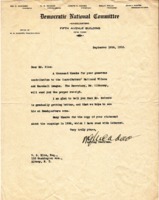 Herbert H. Brown congratulates William G. McAdoo on his move to California. A ticket for the fourth session of the 1920 Democratic National Convention. 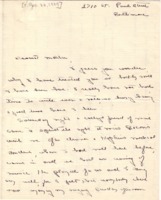 Woodrow Wilson writes Eleanor Wilson McAdoo with family news upon his return from Europe. 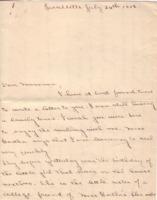 Jessie Wilson Sayre writes Margaret A. Wilson with news of her pregnancy with Woodrow Wilson Sayre. 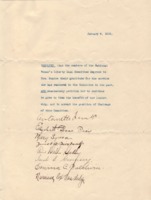 The National Woman's Liberty Loan Committee drafts a resolution making Eleanor Wilson McAdoo Chairman of the committee. 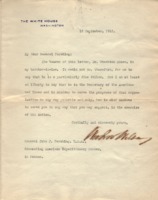 Woodrow Wilson writes John J. Pershing a letter of introduction for Stockton Axson. 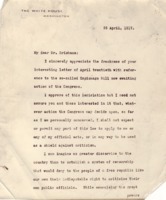 Woodrow Wilson writes Arthur Brisbane to assure him that the Espionage Act will not apply to the President or any of his official acts. 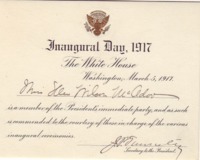 Ellen W. McAdoo's ticket to her father's second inaugural. 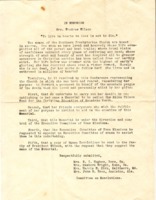 A resolution of the Southern Presbyterian Church establishing the Ellen Axson Wilson Memorial Fund. 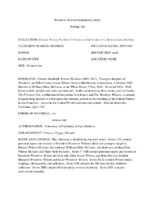 A prospectus for endowment of the Ellen Wilson Memorial Fund. Jessie Wilson Sayre writes Margaret A. Wilson with news of her first pregnancy, with Francis B. Sayre, Jr.
S. Seymour Thomas writes Ellen Axson Wilson concerning a proposed portrait of Woodrow Wilson. 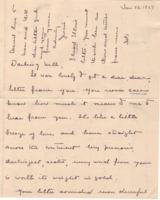 Eleanor Wilson McAdoo writes her sister with family and political news from the trip to Cornish, NH. 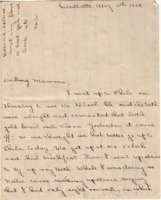 Eleanor Wilson McAdoo writes Margaret A. Wilson with family news from their summer trip to Cornish, NH. Eleanor Wilson McAdoo writes Margaret Wilson with news from her trip to Mexico. 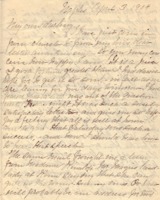 Ellen Axson Wilson writes Eleanor Wilson McAdoo, in Mexico, a letter with news of the family. 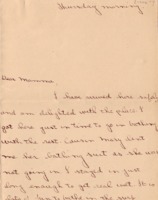 Jessie Wilson Sayre writes Margaret A. Wilson to apologize for not kissing her goodbye upon her sister's move. 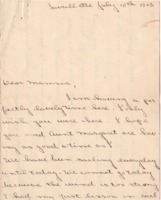 Jessie Wilson Sayre writes Margaret A. Wilson to say she is pleased Margaret is coming to visit. 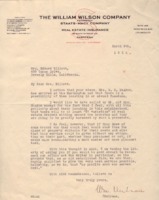 Eleanor Wilson McAdoo writes Margaret A. Wilson; mentions a move from Princeton to Sea Girt, NJ. 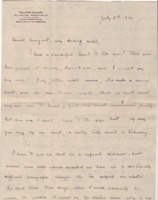 Margaret A. Wilson writes Woodrow Wilson in Bermuda with news from home. Margaret A. Wilson writes Ellen Axson Wilson with news from Baltimore. Eleanor Wilson McAdoo writes Ellen Axson Wilson a letter from her school, St. Mary's, in Raleigh. 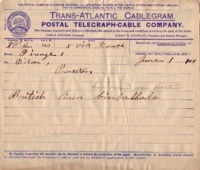 Woodrow Wilson sends Ellen Axson Wilson a telegram from England. Ellen Axson Wilson writes Woodrow Wilson with news from her trip to Italy. 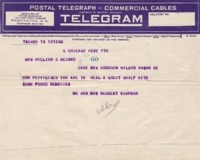 Ellen Axson Wilson sends Woodrow Wilson a telegram with news from her trip to Italy. Ellen Axson Wilson writes Woodrow Wilson with news of her trip to Italy. 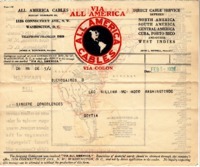 Ellen Axson Wilson sends Woodrow Wilson a telegram regarding her trip in Italy. 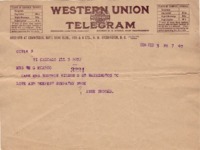 Ellen Axson Wilson sends Woodrow Wilson a telegram from Italy. Ellen Wilson writes Woodrow Wilson with news from her trip to Italy. Ellen Axson Wilson writes her husband, and tells of visiting the Vatican and observing a papal procession. Ellen Axson Wilson writes Woodrow Wilson from Rome with news of her trip to Italy. Margaret Wilson writes her mother with news from a beach vacation. Margaret Wilson writes her father with news from a beach vacation. 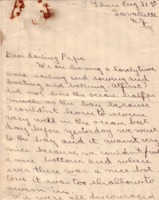 Eleanor Wilson McAdoo writes her father with news from a beach vacation. 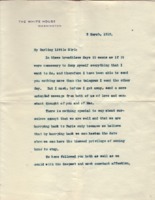 Eleanor Wilson McAdoo writes her mother with news about her trip to Lavallette. 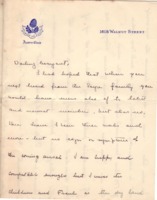 Margaret Wilson writes her mother with news from home. 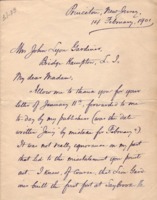 Woodrow Wilson writes the wife of John Lyon Gardiner to thank her for writing to his publisher, to correct a mis-statement in his book. 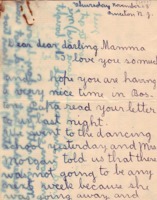 Eleanor Wilson McAdoo writes her mother in Boston with news of the family. 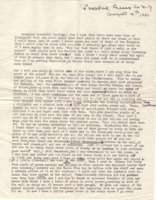 Margaret Wilson writes her father in Scotland with news of the family. 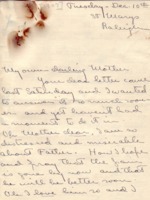 Eleanor Wilson McAdoo writes her father with news about the family. 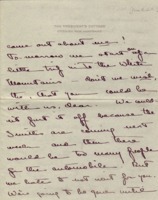 Woodrow Wilson writes Lucy M. Smith with news of his family. Margaret Wilson writes her father that she has three valentines and is making a calendar. 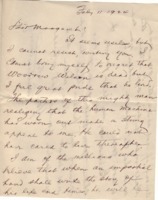 Anne Brooks sends Eleanor Wilson McAdoo a condolence telegram on the death of her father. 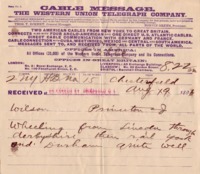 Mr. and Mrs. C. T. Bray send William G. McAdoo a condolence telegram after the death of Woodrow Wilson. 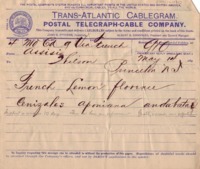 Mr. and Mrs. Thomas Arthur send William G. McAdoo a condolence telegram on the death of Woodrow Wilson. 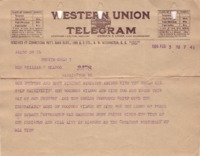 Goytia sends a condolence telegram to William G. McAdoo after Woodrow Wilson's death. 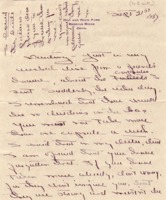 Blossom Hoyt Griswold sends a condolence telegram to Eleanor Wilson McAdoo after her father's death. 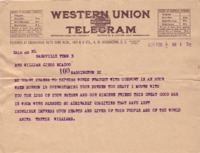 W. Bruce Helm sends William G. McAdoo a condolence telegram on the death of Woodrow Wilson. 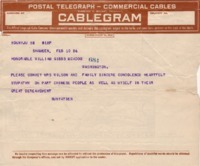 Raphael Herman sends a telegram to Eleanor Wilson McAdoo saying that he found the children happy, and hopes that she will recover from her "unpleasant experiences." 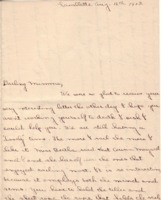 Minerva Hamilton Hoyt sends Eleanor Wilson McAdoo a condolence telegram after the death of her father. 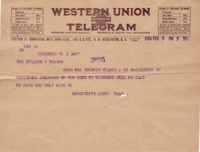 Mario Diaz Irizar sends William G. McAdoo a condolence telegram, on Woodrow Wilson's death, on behalf of the International Bureau for Trademark Protection of Havana. 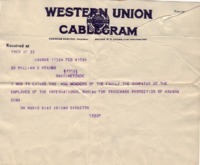 Mr. and Mrs. Herbert Kaufman send a condolence telegram to Eleanor Wilson McAdoo after her father's death. Eleanor Wilson McAdoo receives a condolence telegram on her father's death. William G. McAdoo thanks W.G. Rice for a campaign contribution. 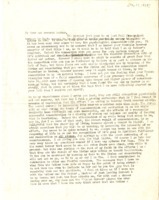 William G. McAdoo writes a letter recommending E.W. Van C. Lucas for Adjutant General of the State of New York. 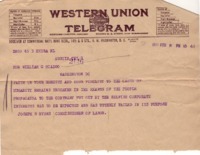 The Chilean Ambassador sends William G. McAdoo a condolence telegram after the death of Woodrow Wilson. 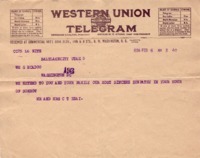 O'Brien sends a condolence telegram to William G. McAdoo after the death of Woodrow Wilson. 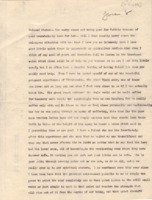 Joseph S. Meyers offers support to William G. McAdoo, after the latter is attacked by "propaganda." 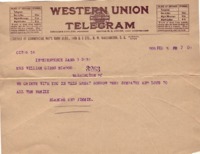 S. Mae Robinson sends a condolence telegram to Eleanor Wilson McAdoo after the death of her father. 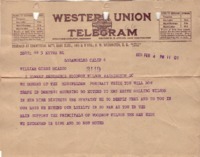 Dr. Sun Yat-sen sends a condolence telegram to William G. McAdoo after Woodrow Wilson's death. 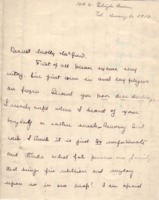 Margeurite Short Tabb writes Eleanor Wilson McAdoo with condolences on her father's death. 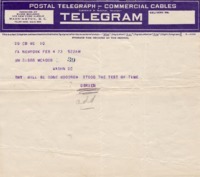 Cora W. L. Trippet sends Eleanor Wilson McAdoo a condolence telegram following the death of her father, and to inform her that she attended a memorial service for him. 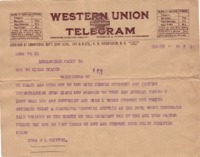 Anita Thetis Williams sends Eleanor Wilson McAdoo a condolence telegram on the death of her father. 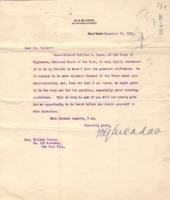 William G. McAdoo writes Governor William Sulzer of New York, to recommend John Mitchell for New York Labor Commissioner.